Even though it isn't officially summer, I tend to start summer off early once Memorial Day comes around. Which means, it's grilling season again! What tasty items have you thrown on the grill so far? We have been enjoying the beautiful weather later and taking advantage of our grill whenever possible. 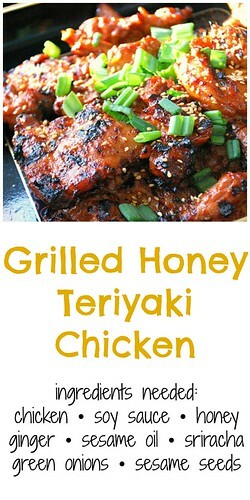 A recent recipe I made for the grill includes this Grilled Honey Teriyaki Chicken. A sweet marinade of honey, soy sauce, ginger, garlic and sesame oil makes for a dish full of 'umami'! One the best things about grilling is that it allows me to marinate meats in a slew of flavors. Wet marinades are great for meats to absorb flavors, just as much as dry rubs, spices and seasonings are for dry marinades. Whatever you prefer, as long as it comes out flavorful, it's a win in my book. This recipe using a wet marinade and I particularly like having the chicken take in all the flavors overnight. Not only does it result in a flavorful dish, but tender, juicy chicken too. 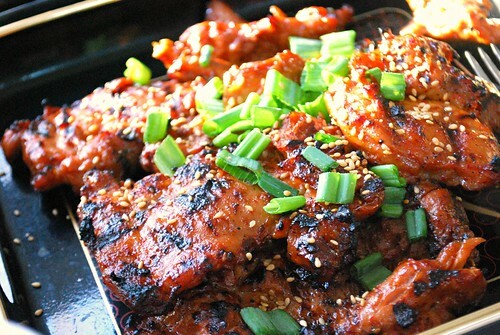 If you wanted this to be on the spicy side, add 2 tablespoons of sriracha or red chili paste in the marinade. It will definitely give you the spicy kick you're looking for with that subtle sweetness in the background. In a large mixing bowl, combine honey, soy sauce, ginger, and garlic (and sriracha if using), mixing well. Add chicken and toss to coat. Cover with plastic wrap and chill overnight. Preheat grill to 350 degrees or on low-medium heat. Grill chicken for 15-20 minutes per side or until cooked through. To serve, garnish with green onions and sesame seeds.